**According to the BBC, this the first time a civic service has been held to mark the June 1973 bombings, and no permanent memorial exists to mark the bombings, nor any list of names. 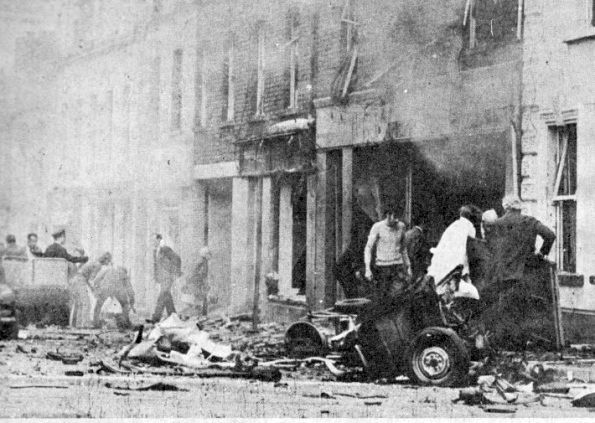 The scene in the aftermath of the Provisional IRA bomb that exploded in Railway Road, Coleraine on June 12, 1973. The explosion killed six civilians. ONE of the darkest days in Coleraine’s history - the IRA bombing of Railway Road forty years ago - will be commemorated by a service in the town centre on Wednesday afternoon. Six people were killed, all pensioners and 33 others were injured, including some schoolchildren in the devastating car bomb attack of June 12, 1973. A Coleraine Borough Council commemoration will take place from 2:50pm at Coleraine Town Hall and the adjacent War Memorial. A short service will be led by the Mayor’s Padre, followed by a wreath laying and a minute’s silence. The public are welcome to attend to pay their respects, council said. UUP councillor, Willie McCandless recalls the events vividly: “The infamy of that day has remained with me over the past 40 years and I remember the victims every year. I was 20 years of age when the bombing occurred and was employed in Ballantyne Sportswear Coleraine. When the news came through to us in the factory it was incorrectly communicated that the bomb had exploded at the Railway Station. Former Ambulance Service worker, councillor David Barbour, recalled feeling the ground heaving beneath his feet as he stood beside his vehicle at Chapel Square. He said: “It was my duty to collect nursing staff and take them to the scene to see what could be done as well as collecting people suffering major injuries and transporting them to the Accident/Emergency Centre. The scene was of people lying in several places, rising smoke, black dust, and damaged buildings. Former Limavady mayor, Sinn Fein councillor Sean McGlinchey, brother of notorious IRA man Dominic McGlinchey was convicted of planting the bomb and served 18 years in prison. The first bomb exploded outside a wine shop around 3pm on Railway Road, while a second device detonated five minutes later at Hanover Place, adding to the panic and confusion in the area. At the time the IRA had sent a warning for the second bomb but said it had mistakenly given the wrong location for the first. The six pensioners who died in the atrocity - Elizabeth Craigmile (76), Robert Scott (72), Dinah Campbell (72), Francis Campbell (70), Nan Davis (60), and Elizabeth Palmer (60) - were all Protestant. The bombings brought about a violent backlash from loyalist paramilitaries, who swiftly retaliated by unleashing a series of sectarian killings on the Catholic community culminating in the double killing of Senator Paddy Wilson and Irene Andrews on June 26 that year.